There's really no way to adequately describe the deftly accomplished, Best Foreign Language Oscar-winning Life Is Beautiful. Effervescent, uplifting, comedic and tragic, Life is Beautiful is an extraordinary film whose spirit explodes on screen like fireworks. 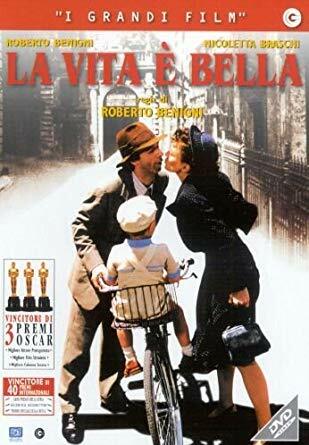 Roberto Benigni, Italy's king of slapstick, plays Guido a young Jewish man who falls in love instantly with the beautiful Dora (Nicoletta Braschi). Several years pass, it’s 1945, Guido and Dora are married and dote on their 5-year-old son Giosuè (Giorgio Cantarini). But the Germans have taken over the town and Guido's new family is transported to a death camp. As the backdrop turns darker Guido tries to shield his son from the horror by convincing him that the camp is an elaborate game, in which points are won against the guards by staying hidden and concealing fear. The prize, he promises, will be a life-size military tank. Benigni creates a situation in which comedy is courage. He draws from this an unpretentious, enormously likable film that plays with history both seriously and mischievously. This is an unmissable opportunity to view a beloved classic once more on the big screen.